I have never previously read any “Bones” books, nor have I ever watched an episode of “Bones,” though my wife and oldest son have been hooked on the television show. I was absolutely riveted to this story. Dr. Temperance Brennan is called to the Charlotte PD’s Cold Case unit. A connection has been made between two child murders that occurred thousands of miles apart and certain clues lead to Anique Pomerleau. Pomerleau had kidnapped and murdered a number of young girls in Canada and then narrowly avoided capture by Dr. Brennan and police detective Andrew Ryan. Brennan would like nothing more than to get this serial killer. She begins her journey by trying to bring Ryan back into the game. He’s retired and been out of touch, wallowing in anger and resentment. As with Brennan, Ryan returns to the chase because it seems that Pomerleau is now working in the Vermont and North Carolina regions. But through the course of the investigation Dr. Brennan will be constantly tested, disappointed, and forced to rethink what she knows about the clues leading to the current point. One of the reasons that I haven’t watched the Bones television series is because I wasn’t drawn to the character of Temperance Brennan as portrayed by the actor, Emily Deschanel (I did try to watch the series). However, I was very much impressed by the character of Temperance Brennan as written by author Kathy Reichs. This Brennan is highly intelligent, but very human. What I found in the written character is obsession. The obsession to not leave an opening ending. The obsession to be right, but tempered (notice the adjective) by the desire to be complete and thorough. This is the 17th book in the Temperance Brennan series, though the only one I’ve read so I don’t know any of the history between Ryan and Brennan, or how much of the story of Anique Pomereau has played out before, but I didn’t feel I was missing out on too much. What I needed to know about any of the relationships was explained through the course of the book’s action. This is precisely the way a series should be written. A new reader should be able to pick up any book and not be confused. And precisely because I was not confused, but in fact, enthused, I’m now wanting to go back and read the entire series. Good job, Kathy Reichs and publisher Bantam. I don’t want to give too much of the ending away but, as I say, I was completely riveted to the book, reading the last quarter (maybe the last third) in one sitting because I really felt the need to know what was next and how it was going to play out. I was thoroughly surprised at how readily Brennan took some devastating news regarding her chief suspect, and how wounded but determined she remained when the killer was brought to justice. This aspect of her characterization is what has hooked me to the series. One bit of information that I assume must be revealed in earlier books is the relationship she has with her mother. There is something that is going on here, something important, that I don’t quite follow. More later (or earlier) I trust. I will also say that considering the title, Bones Never Lie, there was a surprising lack of bones and that bones don’t lead to the conclusion here (though I ‘get’ the use of ‘bones’ in all the titles and that this line is included in the book. Looking for a good book? 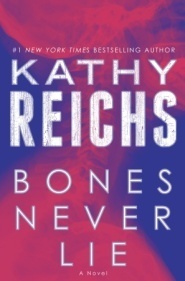 Bones Never Lie, by Kathy Reichs, is the seventeenth book in the Temperance Brennan series and it is easy to see why the series has continued success – deep, thoughtful characters combined with an intricate mystery make for a great read. This is a must read.